For the impatient and/or illiterate: the pictures. We had final exams at BYU last week. Outsiders (and some misguided students) think that finals are the worst time of the semester, filled with nervous studying and stressful, sleepless nights of cramming. I know better, though: finals are a great time for having fun! Just think: your regular class schedule is cancelled, it's almost Christmas break, and all you have to do for the whole week is spend a few hours taking some tests. My freshman year I went skiing three times during finals; last year I climbed a mountain. As good as finals are, the best part actually comes before they start: reading days. For those of you not in the college loop, reading days are two days right before finals when the school calendar is cleared so that students can study for finals. That's what BYU thinks, anyway. We students know better, though: reading days are the best play days of the semester. Reading days were Friday and Saturday, 14-15 December this semester. 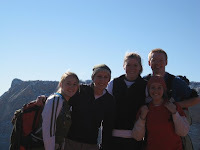 I went down to Zion National Park with what ended up being four girls to go camping and hiking. 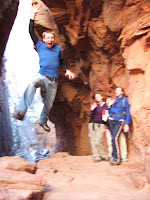 The original plan was to go canyoneering with a bigger group that included more guys than just me, but we decided that canyoneering wouldn't be safe because of the freezing temperatures and the water in the canyons. The guys who were going decided not to come since we weren't going canyoneering, so it ended up being just me and the ladies. We drove down on Friday afternoon and camped at Mosquito Cove right outside the park, which was noticeably lacking any mosquitoes at this time of year. We got there, set up camp, and played Scum for a little while in the girls' tent. When it started getting cold, we decided it was bedtime. It was pretty chilly at night (maybe 15 degrees? ), so I was glad that I brought warm clothes. The four girls slept in a tent together, and I slept alone outside in my new bivy sack. It worked pretty well, and I stayed warm for most of the night, although the frost on the inside and outside of my sack when I woke up made it look like I might have frozen to death. We woke up the next day, had breakfast, packed up camp, and headed into the park. Carianne worked at (but not for) the park this past summer, so she was our expert guide. She listed off a few places that we could go for the day, and we decided to hike up to Observation Point where we would have a great view overlooking most of the park. That's the same trail that I hiked up a few months ago when I went canyoneering in Echo Canyon. The hike was beautiful. 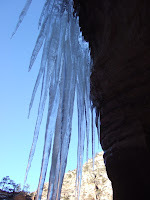 Water slowly flows out of the sandstone at several places along the trail, and since it was cold in Zion, the water was frozen into amazing ice formations. There were icicle gardens, impossibly thin plants that were embalmed in inches of heavy, glittery, crystalized ice, and beautiful (but small) ice waterfalls. As we moved higher, there was snow covering parts of the canyon, especially in shady areas. We reached the canyon rim and had a beautiful view of the Virgin River canyon. We also had a good conversation with a man from Ireland who was spending a few days hiking the park. 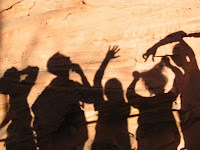 We hiked back down to the trailhead and drove up Zion Canyon and through the tunnel to the to Canyon Overlook trailhead. It was getting dark, but people coming back said the hike was only ten or twenty minutes, so we decided to go for it. We watched the sunlight creep up the highest walls as it fell over the horizon and headed back to the car before the light had completely faded. Although my grades might have benefited a little from staying in Provo and working, there's more to life than school. I'm glad that I went. After all, what will I remember in twenty years? The difference between an A- and a B+, or a trip to Zion?